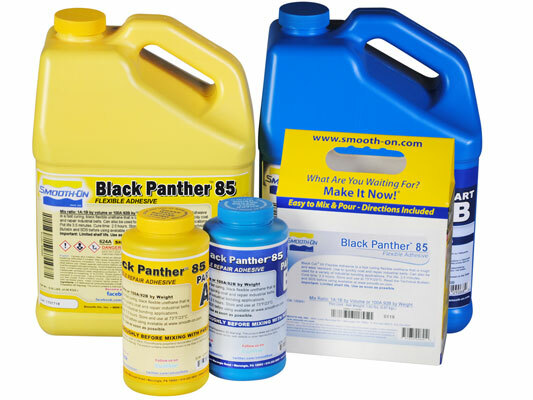 Black Panther™ 85 Product Information | Smooth-On, Inc. Specific Volume 25 cu. in./lb. Shrinkage 0.0038 in. / in. Black Panther™ 85 is a two-component, fast curing liquid adhesive for repairing holes, tears and splits in steel / fabric corded rubber conveyor belts, providing high wear and abrasion resistance. It also provides a strong, flexible bond between a variety of substrates including plaster, wood, cement, stone, glass, hard plastics and a variety of metals. Working time is 3.5 minutes and cure time is 2.5 hours at room temperature (73° F / 23° C). 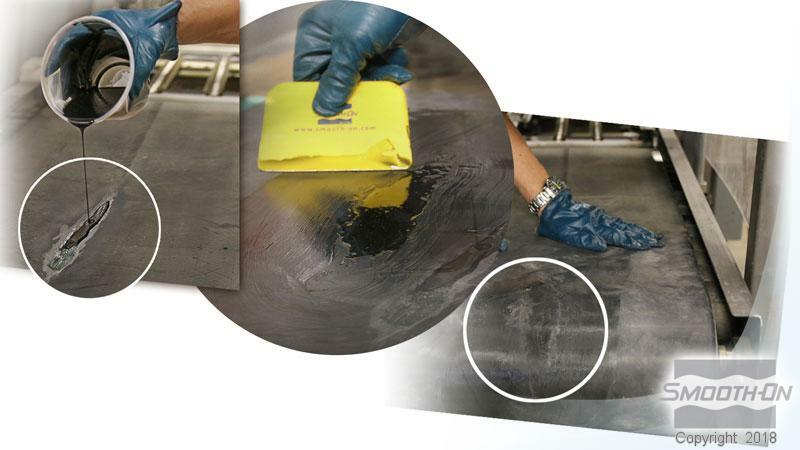 Conveyor Belt Repair - ensure that area to be repaired is free of grease, dirt, or moisture. Clean surface using a solvent. Approved solvents include (acetone, xylene, alcohol). Abrade surface to be bonded using an abrasive wheel or grinding disc. For holes, make sure to use duct tape to bridge holes and prevent adhesive leakage. Blow off any dust using oil-free compressed air. Clean the surface one more time using a solvent. After mixing, apply the material using a spatula or flat edge tool as quickly as possible as it sets quickly. It is better to mix small amounts and add more material as needed. Partially cured material applied to the surface will not create a bond with suitable physical properties. A plastic spatula or a flat edged tool, are best methods for applying the material over a larger surface. Surface Preparation for Bonding Applications - It is essential that the surface of both substrates to be bonded be absolutely clean and dry. Porous surfaces should be sanded until clean and any excess dust removed thoroughly. Non-porous surfaces should be degreased, dried and abraded by sanding, sandblasting or chemical etching - the etching being required for certain surfaces. Solvent wash the surface and let the solvent fully dry before applying adhesive. Stir Part A and Part B thoroughly before dispensing. After dispensing equal amounts of Parts A and B into mixing container, mix thoroughly for 30 - 45 seconds making sure that you scrape the sides and bottom of the mixing container several times. Pour on to prepared surface. Level (scrape off excess) using a spatula or flat edge tool. Position and affix other surface to substrate and clamp together for 2.5 hours at 73°F/23°C . Using in warm environments will reduce pot life and cure time. Cure time can be reduced by applying mild heat.